The Lassy Project™ is relentlessly focused on preventing child abductions. Using a patented combination of GPS, SMS, and crowdsourcing technology, this program keeps kids safe by immediately alerting parents via text message if their child deviates from their usual routes to places like school or a friend’s house, then, if the child is missing, providing them the ability to press a button and mobilize hundreds of neighbors and community members in seconds to help. This group of community members is called the ‘Lassy Village™’. Every Frederick Police Officer is now in the village and encouraging the rest of the community to join them. 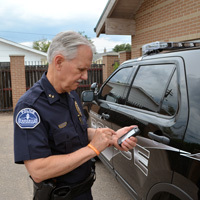 During the month of July, 2014 the entire Frederick police force were trained on how to best utilize the app and register it on all of their cell phones. In this collaborative project, the Town of Frederick Police Department is helping to enroll as many members of the Frederick community as possible into the Village – including parents, community members, first responders, and local businesses. The goal is to grow the Lassy Village™ of Frederick as large as possible. To join the village, simply download and register the Lassy Project app from your app store.